A delegation of several members participated in the March 11 NC Women United “Member Showcase,” and event designed to help members of the public and the members of individual organizations learn more about the programs and priorities of the “membership” organizations that are part of the NCWU coalition. Advocacy – we used the national public policy brochure with an insert giving the status of AAUW NC priorities for the 2009-2010 legislative session. 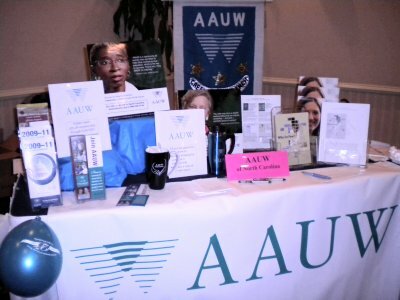 Research – we had a summary of AAUW research and pre-release information on the new report Why So Few? Another table highlighted the National Girls Collaborative Project.